1st, 2013 United States Amateur Doubles Championships (with Robert Leonard). 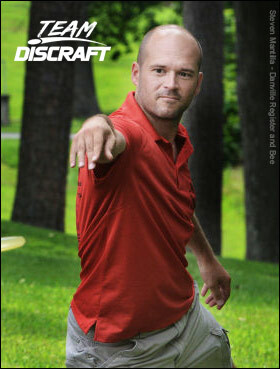 Besides winning the Worlds and US Amateur Doubles, my memorable disc golf moments occur all the time. Whether a really great casual round with new locals, being recognized at the course, canning a long putt in competition, or getting my students interested in the sport, every day is a memorable disc golf moment in the making. Danville, VA This is my home course - where I learned to play, love, and share the game, and I have logged almost 400 rounds there. Charlotte, NC Every time I have played the Hornets Nest course, I seem to play well, throwing a near-1000 rated 54 on several occasions; the course is demanding yet fair, and a lot of fun, and I am excited about the redesign. Inver Grove Heights, MN Even though I have only played this course about four times, I played it extremely well during my 2014 Worlds run, especially in the semifinals; it is a great course with great memories! Rock Hill, SC This could go on anyone's list, whether they have played it or not, but my experiences there in two US Amateur Doubles Championships are hard to beat. Germanton, NC This hybrid course at the Stonewall Golf Course is part of the future of disc golf, in my opinion - private, well-maintained, and challenging courses will become more prevalent, and they will be worth the small amount you might pay to play. Z Force This disc is my current go-to driver for two reasons: first, consistency in its flight and fade, and second, for its stability when I use it for forehand throws. This is the one disc I use equally for backhands and forehands. It fights wind well and has plenty of distance. Since 2014, when I turned professional and realized I should have more throws than just a backhand in my skills arsenal, I worked hard on consistent forehand form, release, and power; the result from throwing the Force enables me to feel great about all that work. Z Crank When I play longer, mostly open courses, I love the Crank. Straighter than the Force, it gives me extra controlled distance when I have some room to spare on the fairway. I really love to watch the Crank fly. Although the Nuke is my longest disc, I rarely carry it because of the control I can get out of the Crank. And if I need a little extra distance, I can give it some anhyzer and know that it will glide a long way before fading. Big Z Predator Like the Force, I use this disc equally for backhand and forehand throws. I also use this disc for thumbers if and when they are needed. Super overstable, the Predator is great for spike hyzers or sharp-turning flicks with a nice skip. I also use this disc for utility rollers out of tough lies. Z Stalker Stalker is stable enough to handle power and fades predictably. I use it when overpowering a midrange is too risky for a particular throw, especially a simple hyzer line; I simply throw a nice smooth Stalker and all is well. Z Heat I love, love, LOVE the Heat. It is the the straightest, longest fairway driver I have ever thrown right out of the box. A smooth release results in a super straight flight with a predictable slight fade. This disc has tons of glide! Need extra controlled distance? Power it up a little, or add some anhyzer, and it's a great hyzer flip choice for shot-shaping. I also find myself thinking about throwing the Heat on a long forehand turnover throw; the snap I would use to make a Force forehand fly straight turns the Heat into a long, glidey, turning throw that goes a long way. ESP XL This disc is well-seasoned. I use this for long turnover shots; with plenty of power, it turns and holds the turning line for a long time. I also carry a Glide, but I find this flippy XL to carry more distance. It's also perfect for hyzer flip shots. Big Z Buzzz OS I love the OS for its ability to fight wind and its strong predictable fade. Like my Force and Predator, I probably use this disc equally for backhand and forehand throws, on holes up to 250 feet. The Big Z plastic feels great in the hand. Z Wasp The Wasp is a workhorse (or could be if I didn't love my Buzzz so much). Any smooth hyzery line lends itself to the straight line and predictable fade of the Wasp. I love using this disc to shape s-curve shots - I release with anhyzer and watch the disc hold, straighten up, and finish with a soft left fade. I don't throw it as often as the Buzzz, but it's a great disc, especially for throwers with a little extra power. ESP Buzzz I throw the Buzzz on about 75% of mostly straight to slight hyzer shots. I love how straight this disc flies. I know that the one I throw is seasoned well, and it will soon be time to break in a few others, but I couldn't imagine any success in disc golf without a Buzzz in my bag. Z Meteor The Meteor is a beautiful disc in flight. Its slight understability makes it a great disc for mid-length turnover shots with little fade. This is especially true for throws with low ceilings where a turnover putter needs more height to work, and where a soft forehand line would just skip away upon fading; I can get a Meteor to work in a give a straight slide at the end without fading. I also love the Meteor for long turning forehands, much for the same reason. I have to give them a little more height to work and pan out to flat, but the Meteor is a great disc for that purpose. X Soft Challenger I use Soft X Challengers for short drives and approaches. As they beat in, which happens reasonably quickly with Soft X plastic, they turn into great turnover discs; I can work them up to 300 feet with a nice high, long turning flight with very little fade. I putt with Challengers as well; they are extremely predictable. Z FLX Zone The Zone is a workhorse utility disc. Need a hyzer approach disc? What about an s-shaped forehand line through a small gap? Short forehand drive off the tee? The Zone works for all of these. Not only that, the FLX Zone absorbs impact, reducing rollaways. I really enjoy throwing this!